Review of a Wavewalk kayak. Review of a Wavewalk boat. 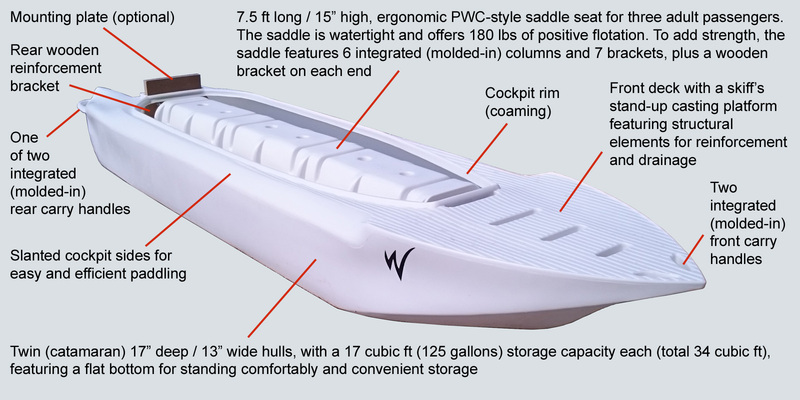 Review of a Wavewalk skiff. Do you like shallow water fishing, and in particular flats fishing? Many fishermen in Texas do, and if you’re one of them, or just interested in this type of fishing, you know that some boats and kayaks are mote suitable than others for it, and some less. The purpose of this website is to expose new types of kayaks and boats that work particularly well in this context, and deliver the most comprehensive solutions both motorized and human powered, namely paddled. This category of small fishing boats is not particularly well defined, but generally speaking, it includes small-size, relatively lightweight, flat-bottomed motorboats designed for fishing in shallow water, flats, protected bays, and estuaries. An important attribute of any microskiff is being sufficiently stable to allow a fisherman to fish standing up in it. 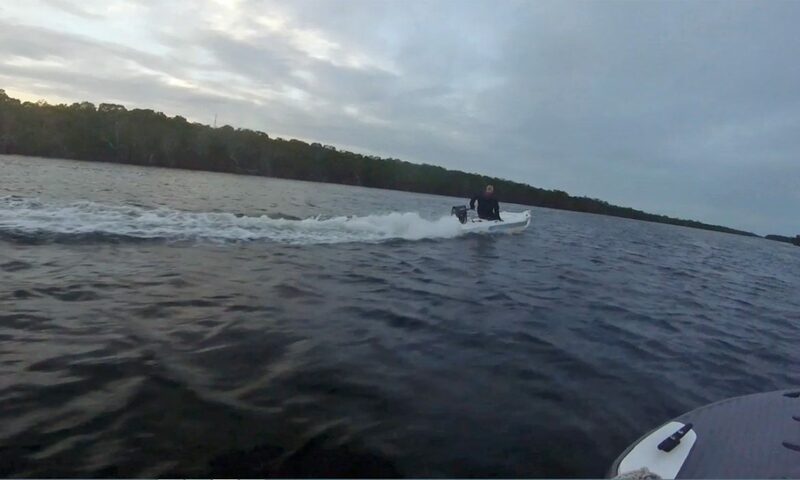 Some anglers use push-poling to advance through areas of thick vegetation and/or skinny water, where an outboard motor’s propeller drafts too much. This mode of human powered propulsion is slow and hard to practice, and therefore not convenient for covering longer distances. Paddling works better, of course, but most microskiffs are too wide to be paddled, and those who do offer such option are still too wide and heavy to enable traveling over meaningful distances, or paddling in adverse conditions, such as wind, current, waves, etc. At 80 lbs (without a motor), the new Wavewalk™ 700 series is the most lightweight microskiff on the market. In fact, it weighs almost half as the next lightweight boat in this class. This makes the W700 is the only car-top microskiff out there. 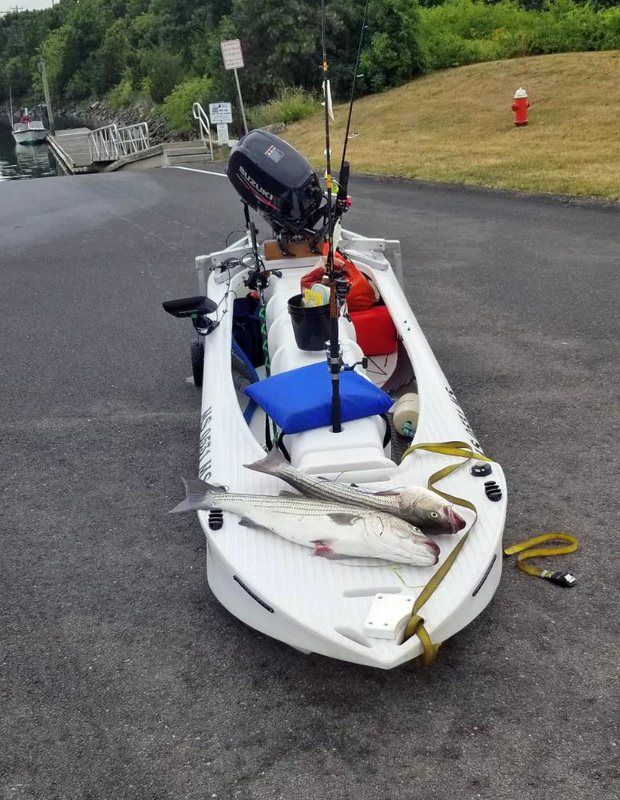 Thanks to its patented twinhull form (catamaran) the W700 is extremely stable, although it’s just 31 inches wide, which makes it the narrowest microskiff and a high-performance paddle craft, namely kayak. Note that it works perfectly as a fishing canoe as well, that is paddled with single-blade paddles, both with a crew of one or two. 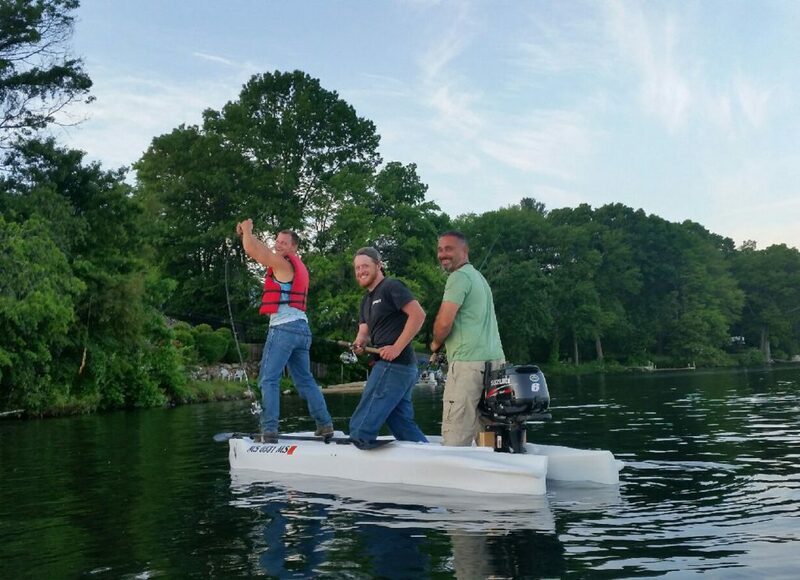 Microskiffs are considerably heavier than kayaks, and they cannot be be car topped. Some of the smallest microskiffs are not designed to take a second passenger or angler on board. Such micro skiffs are called solo skiff, namely a one-person skiff. The W700 is lightweight enough for one person to car-top, and with its total recommended load capacity of 580 lbs and the super-stability to back it, the W700 works as a full tandem microskiff (I.E. motorized) and tandem fishing kayak (I.E. paddled). 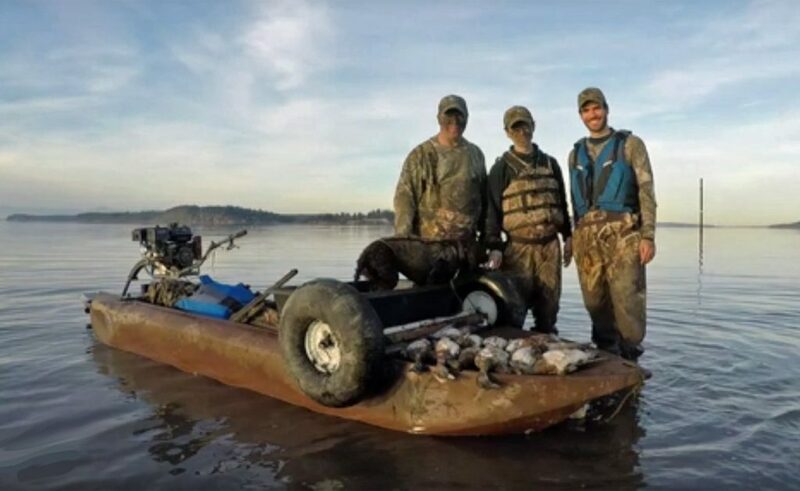 It offers all the advantages of a regular size micro skiff without imposing any of the inconveniences associated with boats, and it offers all the advantages of a fishing kayak, and some more, without any of the problems that plague fishing kayaks, which are instability, wetness, discomfort, poor tracking, and lack of sufficient storage on board.